Marathon Bookcase Headboard Fast Free Shipping! 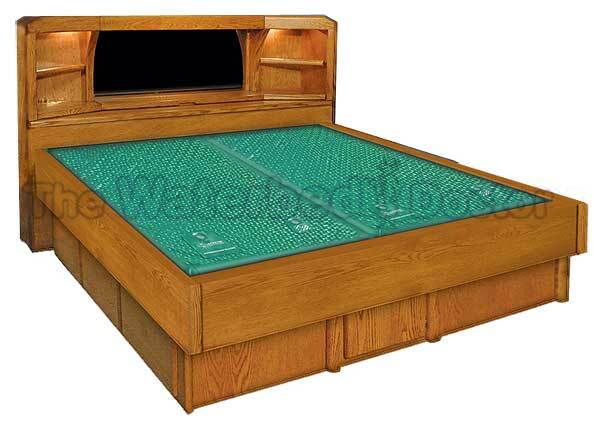 Marathon oak waterbeds go the distance in style, craftsmanship and versatility. Piano hinge opening in center of the headboard above the mirror hidden storage, two glass shelves, mirror in center, piano hinge storage below mirror opens up to hidden storage with more hidden storage to right of opening, built in lights with dimmer switch, phone jack and plugins. Freestanding headboard will accommodate WOOD FRAME mattresses. FREE Accessories. Order Pedestal below. Freestanding headboard will accommodate SOFT SIDE mattresses. Order Pedestal below.